Valerie Jarrett spoke with April Ryan the White House Correspondent and Washington Bureau Chief for American Urban Radio Networks this morning. Jarrett said President Obama would sign up for Oabamacare today. Let’s hope he can get online. Last week the White House admitted that Obama had still not signed up for the plan. 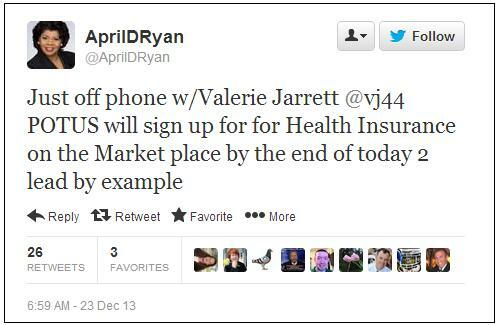 April Ryan also promoted the plan for Jarrett. Valerie Jarrett @vj44 says having health insurance is "peace of mind" for when the unexpected happens. Too bad, Valerie, about those 5 million Americans who already lost their insurance, huh?